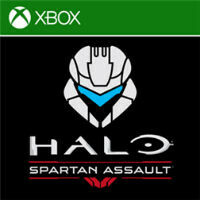 We've been watching and waiting, and Halo: Spartan Assault has finally landed in the Windows Phone Store. The game not only looks amazing from the video we've seen, but it has been garnering some impressive early reviews. Unfortunately, the game is exclusive in the U.S. to Verizon Windows Phone 8 devices until August 16th, but if you don't live in the U.S., you can download the game right now for whatever the equivalent of $6.99 is in your country. The only requirements for the game are that you are using a high-memory WP8 device. The game is a twin-stick top-down shooter that is designed to span the timeline between Halo 3 and Halo 4, although if you don't know the history of the Halo universe, Microsoft promises that the game will still be accessible. If you do know the Halo universe, you will be playing 25 new missions which offer "new insights into the first missions of the Spartan Ops program, the history of the Human-Covenant wars, and the rise of Commander Sarah Palmer." The game costs $6.99, but does include in-app purchases for temporary weapon upgrades. You can purchase a range of credits, from 500 credits for $2.99to $39.99 for 10,000 credits. The credits can then be used to purchase weapon upgrades that expire when you finish a level, so unless you have a lot of cash to toss around, it seems best to save the purchases for when you really can't get through something. WP HAZZ APPZZ AND GAMEZZZ THAT ANDROID AND iOS does not HAVE ! The game costs $6.99, but does include in-app purchases for temporary weapon upgrades. You can purchase a range of credits, from 500 credits for $2.99to $39.99 for 10,000 credits. The credits can then be used to purchase weapon upgrades that expire when you finish a level, so..... Another example how Microsoft fail, not buying even if they support multiple platforms. This will sell in a few thousands copies at best, considering the targeted market. But it's a calculated loss that Microsoft got covered. It's not about earning money but putting some foundations and image into the platform. Too bad even the upcoming WP phones have a 2 year old GPU, so 343 industries is awfuly restricted from showing what it really can do on mobile.